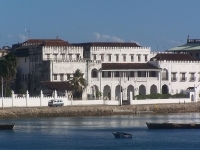 Illuminating the lifestyle of the Sultans of Zanzibar, the Palace Museum (originally called the Sultan's Palace), became the official residence of the Al Busid dynasty in 1911. Built in the 1890s, the extensive white building is situated on harbour road with breath-taking sea views. It is the most recent of the Sultans' palaces and was occupied till the revolution in 1964. The Palace Museum houses an impressive collection of the Sultans' elaborate furniture and possessions as well as a room dedicated to the life of Sultan Sayyid Said's daughter, Princess Salme. Renowned for her manuscript, Memoirs of an Arabian Princess, this significant autobiography is the only known written account of what life was like for Arab women of the Royal court in the 1800s. Excerpts from the book, family photographs and samples of Princess Salme's wardrobe are also on display. Outside the museum is the Makusurani graveyard where some of the sultans are buried. For those interested in the opulent lives of Zanzibar's Sultans this is a fascinating attraction.